1. To pickle the shallots, place the sugar and vinegar into a pan over medium-high heat and allow to come to a boil. Pour the hot mixture over the shallots and allow to cool completely. 2. Season the salmon fillets with salt and place on a preheated barbecue approximately 3 minutes on each side, until medium in doneness. Remove from the barbecue and allow to cool. Using a fork, flake the salmon into small pieces into a bowl. 3. 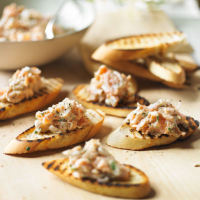 Add the smoked salmon, soured cream, crème fraîche, lemon zest and juice to the salmon in the bowl. 4. Drain the shallots and discard the pickling liquid and combine with the finely sliced sushi ginger. Add to the salmon mixture and add the finely sliced chives then season with salt and freshly ground black pepper. Serve with thinly sliced baguette or your choice of crackers.